The Araxi Restaurant and Bar is one of the Whistler ski resort’s more trendy places to eat. But that’s not why we went there. 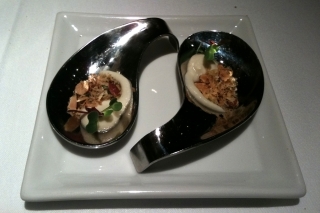 Eating at Araxi (and writing about it) requires some explanation because it is not one of the best restaurants in the world and, quite honestly, our time is valuable. 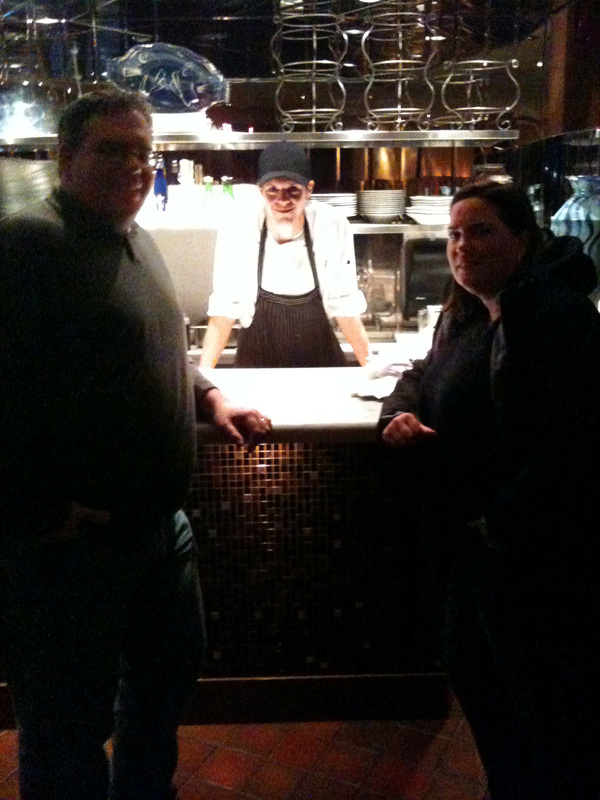 We were going to be in Whistler for the Winter Olympics, but our knowledge of Araxi ties back to having watched the TV show Hell’s Kitchen. We’re not proud to say we watched Hell’s Kitchen. It’s a reality TV show that features Chef Gordon Ramsey berating aspiring chefs until they break. Unfortunately, the previous season featured Andy Husbands, chef/owner of Tremont 647, a restaurant we have eaten in and enjoyed several times. We would have otherwise stopped watching. Probably. Why Andy entered into a competition that is clearly more interested in humiliating people than showing their skill is not known. 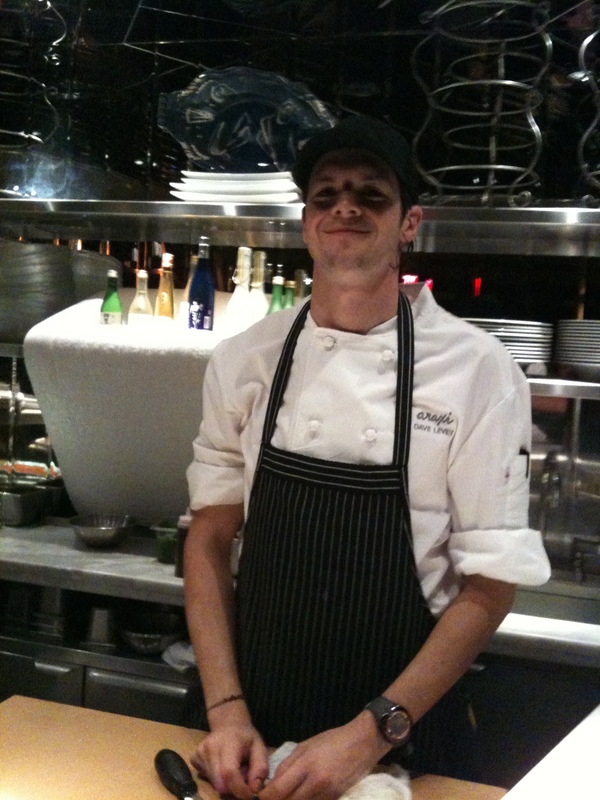 Long story short, we bumped into Dave Levey, winner of Hell’s Kitchen, at Tremont 647 and felt compelled to check out his “prize” of getting to work at Araxi. The connection between Gordon Ramsey and Araxi is thin. Apparently he is just a shill for the restaurant. While Ramsey is known for Michelin starred restaurants, Araxi is not in the same league. Not to suggest that it was bad in any way, but it was way over hyped on Hell’s Kitchen as some kind of mountain-top paradise. What Araxi is might best be described as a slightly over styled restaurant with fresh, well prepared seafood and efficient service. During the Olympics, Araxi was a busy place. We were told that they had double the amount of kitchen staff on that they normally would. The front entrance was jammed, but after cutting through the crowd we were seated immediately. 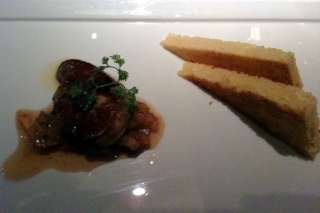 Ruth’s seared foie gras with apple, pear, and cherry chutney and toasted brioche was excellent. It was cooked just right and was really tasty. Doug’s sushi trio tasted very good and arrived on the largest assembly of plates ever created for three pieces of sushi. What the hell? It’s like when the pizza place puts a stand on the table because the pie is too big. Except this is sushi. 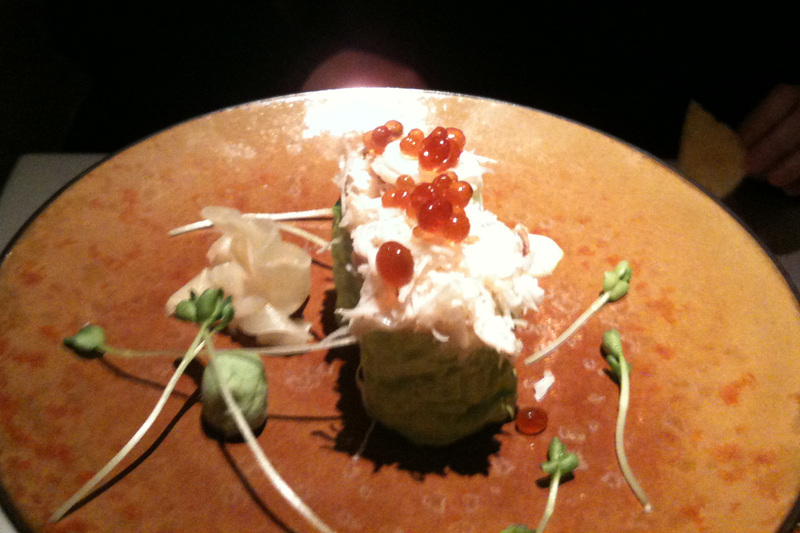 Anyway, this is the Dungeness crab roll. 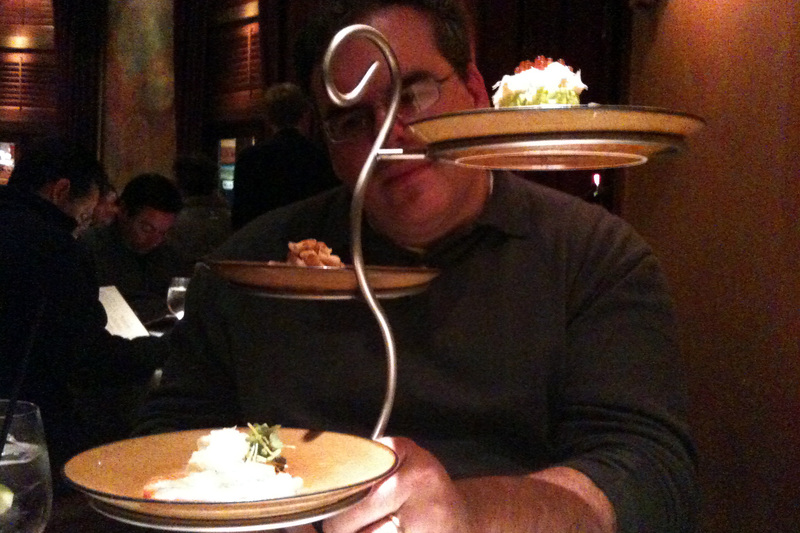 It’s difficult to remember if it was roe on top or something else, but it was good. The seared tuna had a light vinaigrette and little beet juice blobs. Very nice. 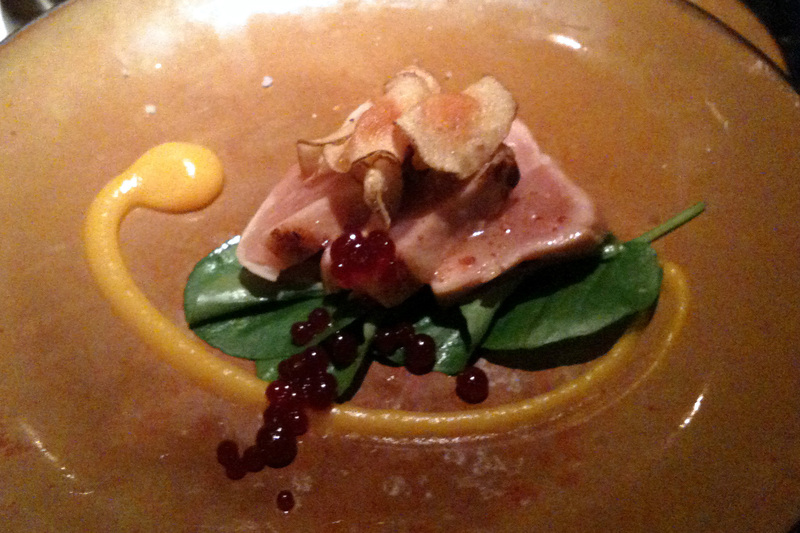 The sunchoke chips were a bit superfluous. 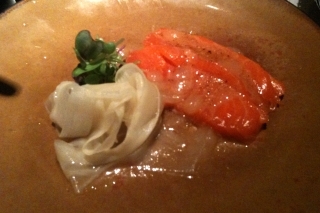 The salmon sashimi alone had a very nice flavor, but the yuzu soy dressing was a bit heavy. Ruth’s grilled halibut was excellent. 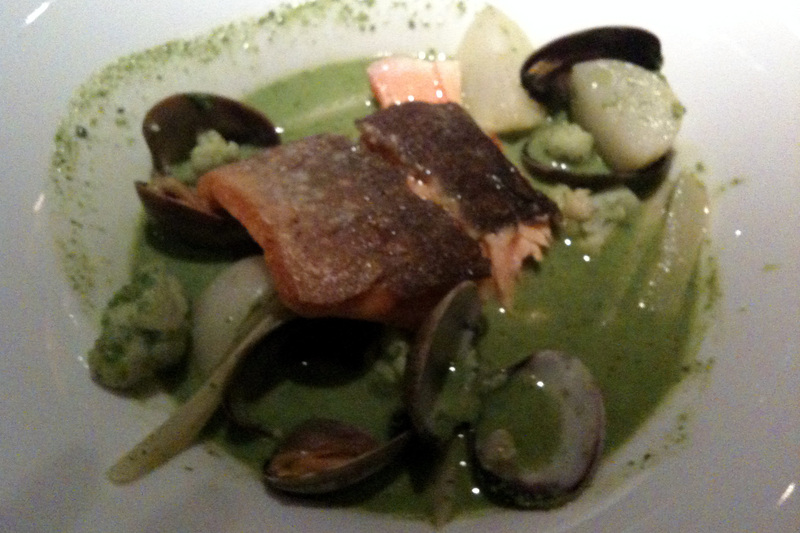 With clams and grilled fennel, this was one of several times we had very good halibut in the Vancouver area. 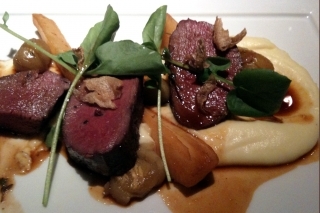 Doug’s roasted venison was cooked perfectly. It was extremely tender and a very tasty cut of meat. 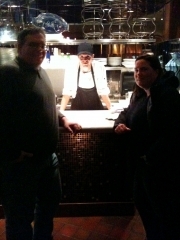 On our way out we stopped to talk to Hell’s Kitchen winner Dave Levey. Dave is a very cool cat. He was working the raw bar and seemed to be having a good time with it. We didn’t ask about the particulars of his employment. We hope they are paying him well. Sorry, no pictures of the washrooms. 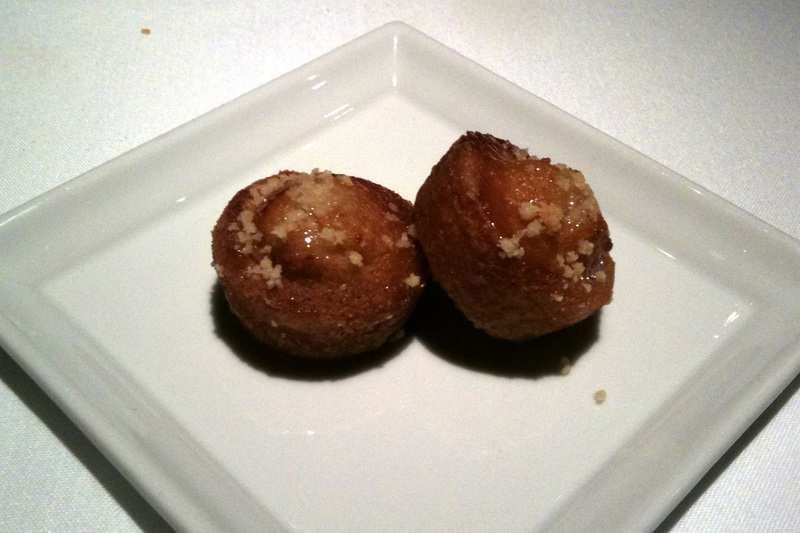 They were clean, but unremarkable. So there you are. Araxi was good. We would eat there again, but only if we were out there skiing. By writing about Araxi, we are setting a bad precedence. They don’t have a tasting menu and don’t have any Michelin stars. The rule is becoming “write about places we see on TV.” Maybe we should add a category for restaurants at an elevation over 5000 feet? Posted in Restaurants on March 20, 2010 by Doug. After about a year of ticket gathering, lodging procurement, reservation making, and Canadian mailing address acquisition, these are the photos documenting our Olympic experience. Included are shots of venues, athletes, security, and fans. While we attended the Women’s Moguls competition, we didn’t break out the cameras due to rain. Pictures of our treks around Vancouver, Whistler, and Seattle will be in another album. The bulk of the pictures were taken with a Canon 10D SLR and f/2.8 70-200mm IS lens. Renting this lens proved to be invaluable. The remaining shots were taken with a Canon S500 point-and-shoot. Sadly the S500 was set-up wrong in manual mode (something we didn’t notice until the last day), so far too many pictures had the shakes and was not the result of one-to-many Molson’s. Posted in Vacation on March 5, 2010 by Doug.